Fractional photothermolysis has been a significant breakthrough in clinical laser science. Fractional lasers employ technology which splits the laser beam into hundreds of microbeams, creating patterns of thermal microscopic wounds that reach deep dermal depths. These small wounds allow a rapid healing response. This method of fractional skin resurfacing has led to clinical efficacy in aesthetic and scar treatments with high physician and patient satisfaction. 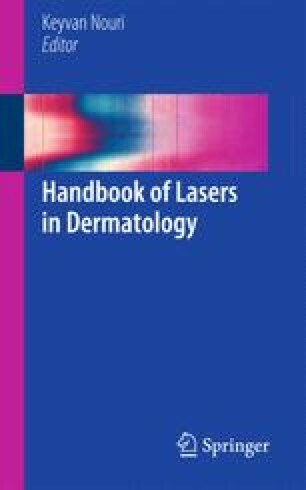 Fractional lasers have a superior safety profile when compared with traditional resurfacing techniques. Fractional laser devices may be either non-ablative or ablative. Non-ablative fractional resurfacing (NAFR) heats up the dermis from 50 to 100 °C; which induces collagen to undergo irreversible coagulation of proteins. Ablative fractional resurfacing (AFR) heats up the dermis to greater than 100 °C; causing vaporization of tissue within the immediate area surrounded by a thermal coagulation zone. NAFR devices were introduced in 2004 with a better safety profile but decreased efficacy versus traditional resurfacing devices (Manstein et al., Lasers Surg Med 34:426–438, 2004). NAFR has become a popular worldwide procedure due to its effective epidermal and dermal rejuvenation, increased safety profile, decreased post-operative downtime, use on all anatomical areas, and wide spectrum of medical and aesthetic indications. NAFR can be used for mild-moderate rhytids, leukoderma, atrophic and hypertrophic scars and many other indications. Despite the success of non-ablative fractional lasers there remained a need for more aggressive tissue ablation for the purposes of rejuvenation of severely photodamaged skin, deeper rhytids and severe scars. AFR devices entered the market in 2007 with improved efficacy over NAFR. There are many fractional devices currently on the market. Many of these devices have distinct technological characteristics that maximize safety and efficacy. This chapter reviews and discusses fractional devices and fractional treatment pearls.